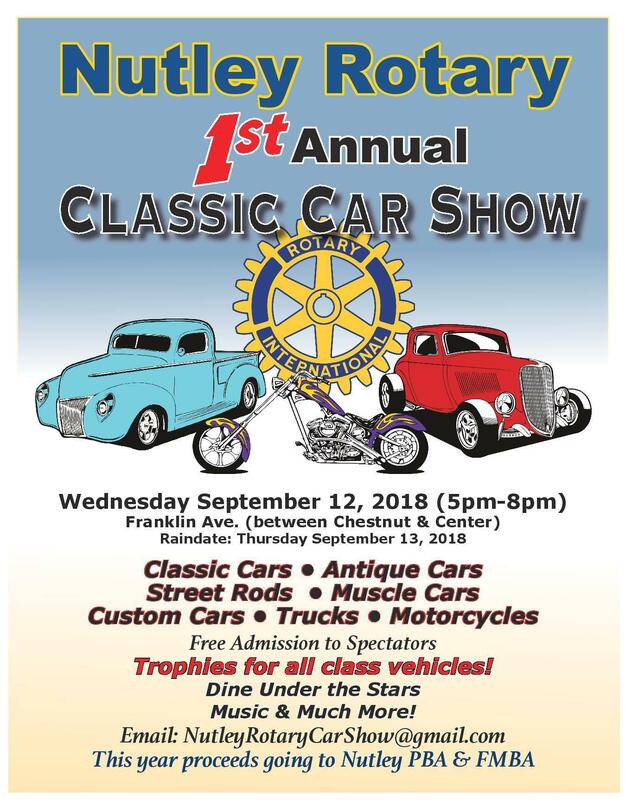 The Nutley Classic Car Show will showcase a large selection of cars, trucks and motorcycles from Classic to Modified. We are planning a night of fun for all ages. There will be numerous food vendors to enjoy from specialty sandwiches and hot dogs to zeppoles. Face painting will also be offered by Color By Chris. We will also have several township organizations (Relay For Life, Thriving Survivors, etc.) and local vendors supporting the car show. Entertainment throughout the evening will be provided by Rob Franicola Ultimate Entertainment. Milton Gil Photographers will be on hand to take commemorative photos as well. We are giving out over 75 Trophies and the first 100 cars or bikes in attendance will receive a gift bag with a commemorative T-shirt and other surprises. We will also be offering commemorative shirts and model cars for sale. We are having a 50/50 Raffle which will benefit the Nutley Rotary Scholarship Fund, benefitting Nutley Schools. These 50/50 Raffle tickets will be sold throughout the evening at numerous locations the night of the event. Our 50/50/ Raffle tickets are also available thru any Rotary member prior to the event.